Your weight and health depend on many factors, from your genetics to your activity levels, so you can't count on one food to make or break your weight loss plan. Dried fruit tends to be higher in calories than its fresh counterparts, which might make it more likely to trigger weight gain, but you won't gain weight if you don't eat more calories than you burn. If you control portion size, dried fruit supplies nutrients that might actually help you lose weight. The balance between how many calories you eat versus how many calories you burn affects your weight -- regularly eating too many calories causes weight gain, while eating slightly less than you need promotes weight loss. Dried fruit can fit into virtually any diet, whether calorie-restricted for weight loss or one designed for weight maintenance or weight gain. However, because dried fruit shrinks during the dehydration process as the water is removed, it's significantly higher in calories by volume than fresh fruit. For example, while a grape and a raisin contain comparable calories, a cup of raisins has more pieces of fruit than a cup of grapes, so it contains more calories -- about 400, compared to 100 calories in a cup of grapes. Dried apples and apricots are also more calorie-dense than their fresh counterparts, providing about 4 times as many calories per 1-cup serving. If you're trying to gain pounds, adding lots of dried fruit can be helpful because you can easily take in extra calories per serving, but this can slow loss if your dieting to lose weight. Always measure your portion size; if you accidentally serve more than you intend, those extra calories can add up quickly. While dried fruits' high calorie content could stall your weight loss if your overeat, adding dried fruit to your diet probably doesn't promote weight gain and might be associated with weight loss, according to a 5-year dietary survey published in Nutrition Research in 2011. The authors analyzed the dietary patterns of about 13,000 Americans and found that those who ate dried fruit -- at least one-eighth cup each day -- had a lower incidence of obesity than people who didn't eat dried fruit. These findings don't necessarily mean that eating dried fruit causes weight loss, because people who ate dried fruit also tended to have healthier diets than those who didn't. However, they do suggest that dried fruits don't directly trigger weight gain. While no food alone will make you shed weight, dried fruit does supply some nutrients associated with fat loss. It's often high in fiber, which keeps you feeling full after your meals and helps support weight loss. Dietary fiber also softens your stool and contributes to its bulk, which fights constipation to keep you regular. You'll also get beneficial iron, a mineral that helps supply your tissues with oxygen, which can help you feel energized and stay active. Iron also plays a role in immune function and it's essential for DNA synthesis, which is involved in production of new cells. 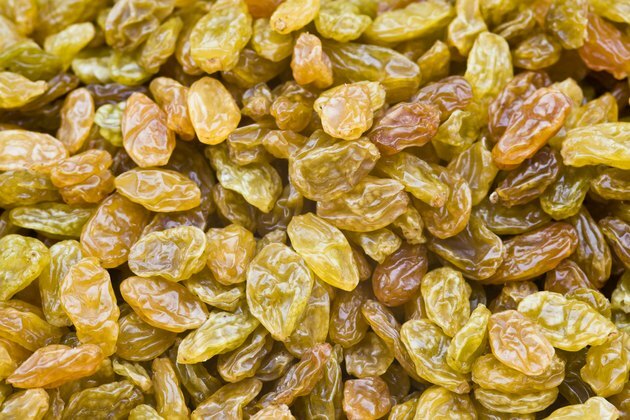 Whether your goal is weight loss or gain, choose the healthiest types of dried fruit. Avoid dried fruits sweetened with added sugar, including fruit sweetened with "natural" sugars, like juice concentrate, brown rice syrup or honey. Added sugar ups the calorie content without adding any nutritional value. So even if you're trying to gain weight, you'll get more benefits by eating a larger serving of unsweetened fruit to take in more calories. While any dried fruit can contain added sugar, it's often used in large amounts during drying of tart fruits, like cranberries, so always check labels for the amount of added sugar. Nutrition Research: Dried Fruit Consumption is Associated with Improved Diet Quality and Reduced Obesity in Us Adults: National Health and Nutrition Examination Survey, 1999-2004.